This is the first book I’ve read in my international crime spree that was published this century. I admit I was skeptical. I tend to think that contemporary thrillers are often fairly formulaic, eagerly adding torture and piling up the (yawn) serially murdered bodies instead of deepening character or giving the narrator a twisty strategy or two. Barbara Vine could give lessons, but do they listen? Mostly, they do not. 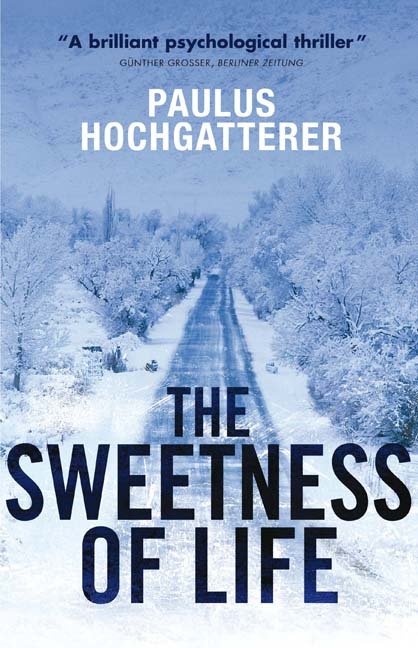 However, Paulus Hochgatterer, an Austrian author and child therapist, won the European Union Prize for Literature for The Sweetness of Life, so I thought I would give it a try. In fact, I was pleasantly surprised at how gripping it was. It takes place in a small and apparently tranquil Austrian town. Events are unleashed by a particularly gruesome murder: an elderly man’s head is completely crushed, and afterward his granddaughter Katerina won’t say a word. The police superintendant, Kovacs, and Raffael Horn, the child psychiatrist who is treating Katerina, are both working toward the same end — finding the murderer — though their paths never cross. But the book has a very loose structure. Horn works in psychiatry at the local hospital, and he sees all kinds of broken and damaged people, from Herr Schmidiger, who is a grinning sadist with his children, to poor sad Heidemarie, who only wants her parents to acknowledge her. He sees drug addicts and postnatal depression, alcoholics with the DTs and elderly men with post-traumatic stress disorder from the second World War, patients who see visions and patients who have entire invented families, elaborate fantasies that sustain them in their daily lives. Reading these sections is like lifting the corner of perception and seeing something new, something you always suspected might be there. The previously tranquil town feels claustrophobic, and yet the possibility of healing remains. Other sections visit those broken minds more closely. There are sections narrated by a priest on the verge of going insane, and others by a young boy following the instructions of his sociopathic older brother. Which of these committed the murder? In fact, the murder itself loses impact as we follow one person after another. The book is more about the thoughts and lives of the people in the town than it is about the killer or the victim. I didn’t see that as a downside, necessarily, but if you’re looking for a straightforward mystery formula, you won’t find it here. I will say that it worked less well for some characters than for others. Horn’s wife, Irene, for instance, was a wonderful character, but her uneasy relationship with her son was hinted at rather than explored, because we were too busy looking at other fascinating people. For me, this book was a pleasure to read and yet extremely difficult to continue. One of the main reasons I read is to understand the human condition, so reading about all these case histories — so well- and so sympathetically-told — was fascinating. I wanted there to be even more. The book lacked the normal misogyny of thrillers, as well; the women characters were real people. The book was well-written and well-observed, and I really enjoyed reading it. On the other hand, there were a couple of extremely graphic, gruesome descriptions of violence, and there were children in peril, two elements that I find it very, very hard to read about (particularly the latter, now that I am a mother.) I had to keep taking breaks from the book, but I also had to keep picking it back up again, and had to finish. If you can bear it, I definitely recommend this one. Translated very smoothly by Jamie Bulloch. Haven’t read this one and I’m not sure I will, although it does sound interesting. Like you, since I first became a mother (almost 20 years ago), I have found it difficult, if not impossible, to read books where children are killed, abused, or in great peril. I’m sure I’ve missed a lot of good books because of it, but I know I’ve missed a lot of nightmares too.